Looking for a New INFINITI Q60 in your area? 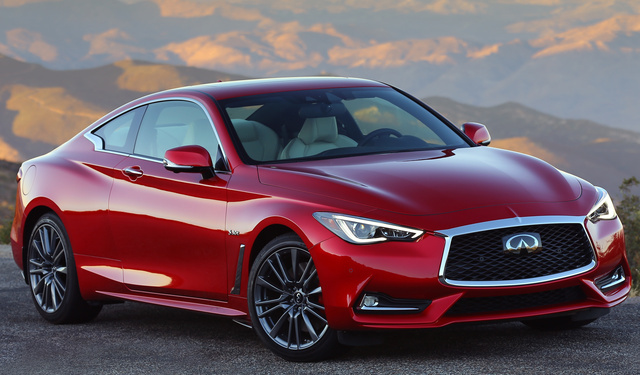 CarGurus has 221 nationwide INFINITI Q60 dealers with 1,597 new car listings. INFINITI launched the all-new Q60 for the 2017 model year, and this attractive performance-luxury coupe returns for its sophomore performance in 2018. The combination of elegant, head-turning style and thrilling performance makes the Q60 a fetching option among premium coupes like the Audi A5, BMW 4 Series, or Cadillac ATS Coupe. It pushes the style portion of the equation while offering available performance trims that will give any of its rivals a serious run for their money. Though the Q60 shares a platform with the Q50 sport sedan, its 2-door layout allows for a more flowing aesthetic. 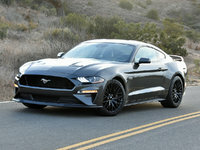 The front end is dominated by a large grille flanked by menacing headlights, and its profile displays accent vents behind the front wheels. The only major exterior tweak for 2018 is the addition of Solar Mica as an available premium metallic exterior paint color. Moving inside, the Q60’s cabin is a bit more function-focused than the exterior, but it maintains the same dynamic yet tailored design language with its curves and flowing lines. The dual-arch layout gives the impression of individual cockpits for the driver and passenger, and the driver is treated to a binnacle instrument panel and a slim, functional sport steering wheel. For 2018, INFINITI has updated the Q60’s trim lineup to bring it more in line with the rest of the INFINITI range, and trims include the PURE, LUXE, SPORT, and RED SPORT 400. The base PURE trim comes with aluminum interior trim, LED headlights, dual-zone automatic climate control, a reversing camera, remote keyless entry, and push-button start. Moving up to the LUXE trim adds a 13-speaker Bose Surround Sound system, a power moonroof, and an auto-dimming rear-view mirror. The Q60 SPORT trim gets carbon fiber trim, aluminum pedals, steering-wheel-mounted paddle shifters, and leather-appointed sport seats. The RED SPORT 400, meanwhile, puts performance first with 20-inch alloy wheels, unique exhaust tips, and summer tires. These wheels are not only larger in diameter but wider, ensuring more grip around tight bends in the road. No matter the trim, the Q60 comes with INFINITI’s InTouch infotainment system with a dual-screen setup. Main menu functions are performed on the lower screen, while more detailed submenus and the navigation map are displayed on the upper screen. It’s a rather complicated and confusing setup that can take some getting used to, and if you’re already on the fence between the Q60 and another car, the InTouch layout might be enough to sway your decision. Luckily, you can use voice controls for many of the vehicle’s features, ensuring that you won’t get distracted while driving. The Q60 PURE and LUXE trims come standard with a turbocharged 2.0-liter 4-cylinder engine good for 208 hp and 258 lb-ft of torque. Next up is a twin-turbo 3.0-liter V6 that comes standard on the SPORT and is available on the LUXE trim. It makes 300 hp and 295 lb-ft, and an upgraded version of this engine is also found in the RED SPORT 400. As the name suggests, it’s tuned to put out 400 hp and 350 lb-ft.
On all Q60 engines, power is sent through a 7-speed automatic transmission. The Q60 comes with a manual shift mode and Downshift Rev Matching, which “blips” the throttle in downshifts for smoother transitions. All models can be had with either rear-wheel drive (RWD) or the available all-wheel drive (AWD). EPA fuel-economy estimates have not yet been announced, but expect the 2018 Q60 to be very similar to last year’s model, with 19-22 mpg city, 26-30 highway, and 21-25 combined. The RWD 2.0t model will be the best performer in terms of fuel efficiency. INFINITI leads the way in steering technology with its Direct Adaptive Steering system, which is included in the new ProActive package and is essentially drive-by-wire. The Drive Mode Selector, located in the center console, allows you to tune the suspension, engine, and steering via Snow, Eco, Standard, Sport, and Customize drive modes. Standard safety features across the Q60 lineup include dual-stage front- and rear-impact airbags, the LATCH child-seat anchoring system, an energy-absorbing steering column, Vehicle Dynamics Control, and a tire-pressure monitoring system. The new ProActive package adds auto-leveling headlights, intelligent cruise control, blind-spot intervention, lane-departure warning, and lane-departure prevention. Also available is the ProAssist package with forward emergency braking, a 360-degree camera with moving-object detection, a blind-spot warning system, and rear cross-traffic alert. What's your take on the 2018 INFINITI Q60? Users ranked 2018 INFINITI Q60 against other cars which they drove/owned. Each ranking was based on 9 categories. Here is the summary of top rankings. Have you driven a 2018 INFINITI Q60? Enter your zip to see incentives for a new Q60 in your area. Looking for a Used Q60 in your area? CarGurus has 2,367 nationwide Q60 listings starting at $12,444.